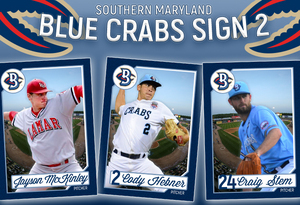 (Waldorf, Md., March 7, 2018) - The Southern Maryland Blue Crabs announced the addition of three pitchers to their current 2018 roster. Right-handers Cody Hebner and Craig Stem will return to the team for another season, alongside newcomer RHP Jayson McKinley. Hebner will return to Southern Maryland for a second season with team. The hard-throwing reliever was a vital part of the Blue Crabs success in 2017, going 4-1 on the season with a 3.50 ERA, while appearing in 50 games. Despite throwing just 43.2 innings on the season, Hebner was able to record 58 strikeouts, the highest total among all Blue Crabs relievers. The former San Diego Padres farmhand was originally drafted by in 2011 out of Green River Community College. Hebner spent five seasons in the Padres organization, being named one of the team’s top 25 prospects in 2013. The versatile Stem comes back to the Blue Crabs for his third season with team, originally being acquired via trade from the New Britain Bees in 2016. The native of Hermitage, Tennessee appeared in 30 games for Southern Maryland last season, including making four starts for the team. Stem came on strong late in the season as the Blue Crabs pushed towards the playoffs, posting a 1.31 ERA in August – the second-lowest on the team for the month. The Trevecca Nazarene University alum spent five seasons in the minors, his first four with the Los Angeles Dodgers before being traded to the Miami Marlins organization in 2015. After reaching as high as AAA in affiliated ball, Stem joined the Bees for his Atlantic League debut in 2016. The right-handed McKinley joins the Blue Crabs pitching staff for his first season in the Atlantic League. The 24-year-old went undrafted out of Lamar University, posting a 1.04 ERA after being moved to long relief at the end of his senior season for the Cardinals. McKinley drew the attention of the Tampa Bay Rays with his strong finish to the year, signing with the organization for the 2016 season. The reliever appeared in 11 games for the Hudson Valley Renegades that season, finishing with a 1.21 ERA and seven saves, second-highest total for the team that season. McKinley moved up to the Bowling Green Hot Rods for the 2017 season, going 4-1 and averaging a strikeout per inning for the Rays Single-A affiliate.